Do you have a question about the hall? We’ve tried to answer as many as possible here. Alternatively, you can contact us if you need some more information. The hall currently has 2 bookable spaces, the main hall and the committee room. The Committee Room has a carpeted floor. How many people can use the hall? Does the hall have heating? The main hall has heating and air conditioning operated by a controller in the hall area which is indicated by signage. The upper and lower temperatures are restricted for economy. The committee room has an electric heater. Yes, there are 12 large rectangular tables, 6 smaller square tables and more than 100 chairs and usage is included in your hire fee. Please ensure that you return the tables and chairs to the storage areas after your event. Due to breakages, we do not provide glassware however local supermarkets will lend / hire glassware for events. You are welcome to use a bouncy castle inside the hall, on the patio or on the grass areas outside the hall. Please note that if you use a bouncy castle inside the hall, you are responsible for ensuring that no damage is done to the wooden floor. Hirers are responsible for ensuring that any inflatables are properly set up, operated and insured. YKRA do not accept any responsibility for injury or damage to persons or property caused by use of inflatables. If you are planning to sell alcohol as part of your event, you will need a Temporary Event Notice from Wiltshire Council. These carry a £21 fee and hirers are responsible for ensuring that they have applied for and received a TEN ahead of running an event where alcohol is sold. If you are planning to provide alcohol to guests free of charge, or invite guests to bring their own alcohol, you do not need a license. You can pay by cheque, cash or Bank Transfer. Because of the cost of processing, we are unable to accept debit card / credit card payments. How do I get into the hall for my booking? When your booking is confirmed, we will give you instructions on how to access the hall. Can I use the outdoor spaces? Yes, when booking the hall you can use the patio and spaces outside the hall including the play area. Please note that the fields and play area are open to the public at all times. The small garden at the rear of the hall is for use by Bybrook Preschool only. Does the hall have a car park? Yes, there is a large car park with space for around 40 cars. Vehicles are left at the owners’ risk. Is there power outside the hall? By prior arrangement, we can give you access to an external power supply on the field. Do you provide cleaning equipment? Yes, we provide a vacuum cleaner, mops and other cleaning equipment. Please do not use any chemicals on the hall floor other than those provided. If you would like us to arrange a professional clean before or after your event we will be happy to do so for a small fee. A full clean before and after the event is included in all wedding bookings. Can we decorate the hall for our event? Yes, you can decorate the hall as you wish providing you return it to the condition in which you found it after your event. There is usually bunting hanging in the hall which can be taken down if you wish – please let us know in advance. There are hoists to raise decorations up into the roof space. We can put you in touch with suppliers of complete lining systems for the hall for weddings. Yes, the hall has a PRS licence for music. You are welcome to use a DJ, band or your own music system. Please keep music to a reasonable volume, particularly after 10pm. When playing music, please keep the rear doors of the hall closed to limit noise to our neighbours. 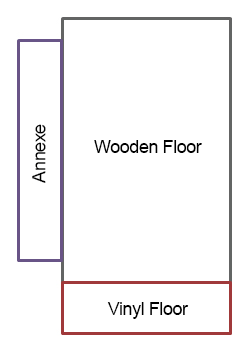 What type of floor does the hall have? The main hall has a sprung wooden floor making it ideal for dance and indoor sports. Does the hall have a skittle alley? Yes, in fact it has two. Large panels lift out of the main hall floor and equipment to set up 2 lanes, including bumpers, skittles and balls are included with your hire. Let us know if you’d like us to set it up for you. Hirers are responsible for making themselves aware of all fire exits and escape routes. The hall is equipped with a number of fire extinguishers and a fire blanket. Please note that there is no fire alarm system as the hall is not currently required to have one, however smoke alarms are fitted. Emergency evacuation notices are located in the hall for your information. There are multiple fire exits in each area of the hall.